strip search prank call scam | SALVATION! it was Love before it was even Love! what can a simple man do? just tell her; just say YES! How long have you felt like this, Ray Liotta? but the Cognac tells him to THINK! How did you find her, Ray Liotta? It doesn’t matter – what matters is NOW! What you gwan do today? 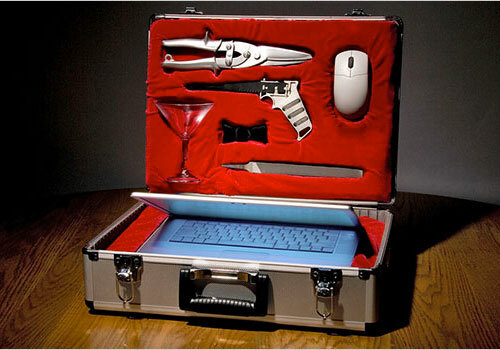 –>Hello Wired, boingboing, (and the list goes on…) watchers! WikiScanner is available for English, Nederlands, 中文, Polski, Italiano, Deutsch, Français, and 日本語 Wikipedia. organization that we don’t? Specify it! [WARNING] This list contains descriptions and images of human experimentation which may cause offense to some readers. 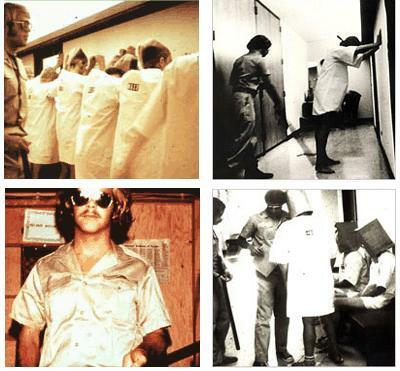 Human experimentation and research ethics evolved over time. On occasion, the subjects of human experimentation have been prisoners, slaves, or even family members. This is a list of the 10 most evil and unethical experiments carried out on humans. Wounds inflicted on the subjects were infected with bacteria such as Streptococcus, gas gangrene, and tetanus. Circulation of blood was interrupted by tying off blood vessels at both ends of the wound to create a condition similar to that of a battlefield wound. 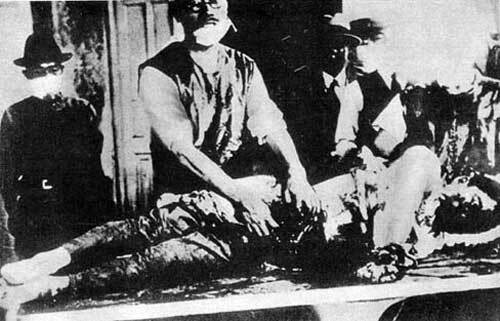 Infection was aggravated by forcing wood shavings and ground glass into the wounds. The idea was simple: to see how ordinary men, chosen to be the most healthy and ‘normal’ would respond to a radical change to their normal roles in life. Half were to become prison guards, the other half their prisoners. In this experiment there were no half-measures, for it to be effective it had to closely approximate the real experience of prisoners and guards. These participants were in for the ride of their lives. ‘Prisoners’ were ‘arrested’ by a police car with sirens wailing while they were out going about their everyday business. Then they were fingerprinted, blindfolded and put in a cell, then stripped naked, searched, deloused, heads shaved, given a uniform, a number and had a chain placed around one foot. The other participants were made into guards who wore uniforms and were given clubs. 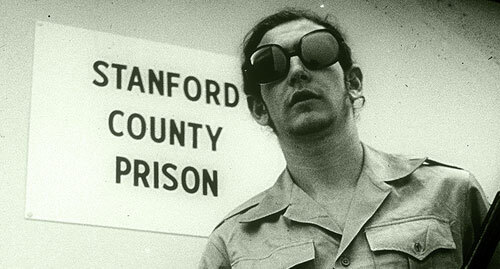 A prison was mocked up in the basement of a Stanford University building. Prisoners coped with their feelings of frustration and powerlessness in a variety of ways. At first, some prisoners rebelled or fought with the guards. Four prisoners reacted by breaking down emotionally as a way to escape the situation. One prisoner developed a psychosomatic rash over his entire body when he learned that his parole request had been turned down. Others tried to cope by being good prisoners, doing everything the guards wanted them to do. 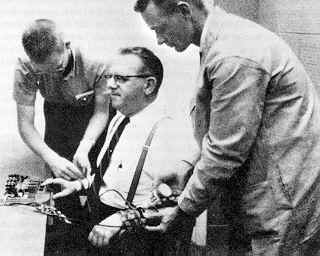 I am also quite fond of the Milgram Experiment! The “teacher” was given a 45-volt electric shock from the electro-shock generator as a sample of the shock that the “learner” would supposedly receive during the experiment. The teacher was then given a list of word pairs which he was to teach the learner. The teacher began by reading the list of word pairs to the learner. The teacher would then read the first word of each pair and read four possible answers. If the answer was incorrect, the teacher would administer a shock to the learner, with the voltage increasing for each wrong answer. 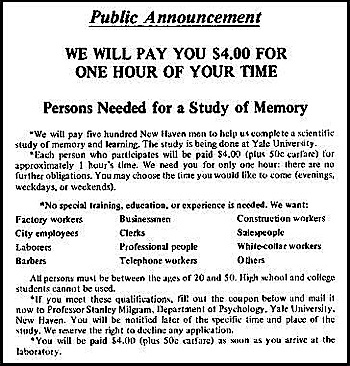 This is the newspaper ad that recruited subjects for Stanley Milgram’s obedience to authority experiments. As you can see, subjects were told they were being recruited to aid research on memory and learning. In reality, Milgram was studying how far down the path of evil average people would go, simply because someone in a lab coat told them to. 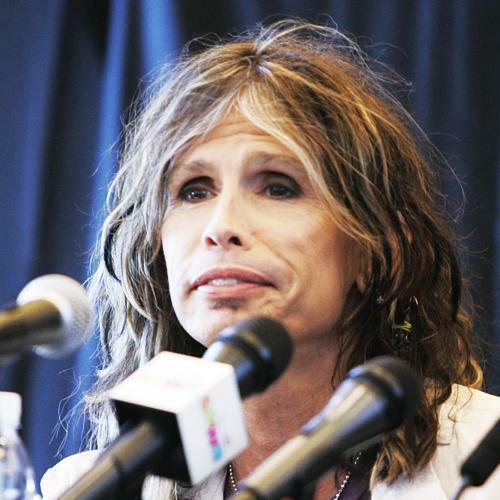 The “teachers” believed that for each wrong answer, the learner was receiving actual shocks. After the confederate was separated from the subject, the confederate set up a tape recorder integrated with the electro-shock generator, which played pre-recorded sounds for each shock level. After a number of voltage level increases, the actor started to bang on the wall that separated him from the subject. After several times banging on the wall and complaining about his heart condition, all responses by the learner would cease. Some test subjects paused at 135 volts and began to question the purpose of the experiment. Most continued after being assured that they would not be held responsible. A few subjects began to laugh nervously or exhibit other signs of extreme stress once they heard the screams of pain coming from the learner. 1. Please continue.2. The experiment requires that you continue. 3. It is absolutely essential that you continue. 4. You have no other choice, you must go on. THIS, however, is absolutely sickening!